John Dorney takes a look at the great killer in Ireland in 1918-19, not political violence or the Great War, but the ‘Spanish Flu’. The year 1918 is justly remembered in Ireland for the election that led to the formation of the First Dáil, but for people at the time, an equally pressing concern was the outbreak of the ‘Spanish flu’. The epidemic is estimated to have killed 40 million people worldwide and in six months infected some 800,000 people in Ireland and killed about 23,000. To put this into context, from 1916 to 1923, about 4-5,000 people died in political violence in Ireland. The flu epidemic which raged from July 1917 to March of 1919, when it suddenly and mysteriously vanished, killed only slightly fewer Irish people than the four years of the Great War, in which an officially recorded total of 27,405 Irishmen lost their lives. In their annual report, the RIC noted the impact of the epidemic in virtually every county. In Cavan they reported, “the disease carried off a great many and affected nearly every household”. According to Cumann na mBan activist Eillis Bean Ui Chonaill, ‘In November, 1918 the ‘flu epidemic or “Black ‘Flu”, as it was called, was rife in the city and country alike. Doctors and nurses were taxed to capacity and the death rate was very high. It was not unusual for whole families to be stricken down together’. The registrar general William Thompson suggested that no disease since the Great Famine had ‘wreaked so much havoc’. Global mortality from the epidemic. The epidemic came in two waves, one being of a mild type of illness and the second being more severe. The symptoms of the first, or milder flu, were lack of energy, aching pains, rising temperature, unstable pulse, sore throat, headaches, loss of appetite, gastro-intestinal pains, immobilising a person suffering from the disease. The symptoms of the second type were similar to the first but a patient quickly developed pulmonary complications, that is, the lungs became infected and bronchial pneumonia, or blood poisoning, set in. At times the patient turned purple, or even black – leading to the disease being widely nicknamed, ‘the black flu’. Seamus Babbington, an Irish Volunteer from Carrick on Suir recalled, ‘ I got it bad and was In bed for a month and the blackest man in Africa was not blacker’. The more virulent strain of the so-called ‘Spanish flu’ (due to an early outbreak in Spain), was notable in that it primarily killed healthy young adults, often, doctors reported within 24 hours of onset. In Dublin, a notoriously unhealthy city at the time, mortality rates rose from 31.4 per thousand in first quarter of 1915, to 37.7 in the first quarter of 1919. Dublin, a notoriously unhealthy city at the time, had high mortality rates anyway; 31.4 per thousand in first quarter of 1915, for example. The main killers especially of children were diarrhoea, dysentery, enteritis and whooping cough. In February 1919, coinciding with a further outbreak of the flu and of ‘sceptic pneumonia’ Dublin Corporation made influenza and pneumonia ‘notifiable diseases’ –that had to be reported to the authorities. Death came very suddenly to healthy young people. James Kavanagh a Volunteer in Dublin was visited by his brother Sean (or John, the family used both names) in May 1919. Sean was in good spirits, fooling around threatening to cut off his friend’s hair with a shears. As the afternoon progressed he complained of terrible pains in his stomach and went home to rest. I don’t know what he died of, whether from an attack of the ‘flu or from heart failure, but we gave him a soldier’s funeral and the Standing Committee of Sinn Féin passed a resolution of sympathy, the notification to me of which I still have’. In 1918 in Dublin, 9,008 births and 9,397 deaths were recorded. There were 1,506 deaths from influenza and 1,140 deaths from flu-related pneumonia. In North Galway Fever hospitals there were an average of ten deaths a week and sad reports came in of both parents dying and leaving large families. Doctors were often the only people in a parish fit enough to bury the dead. In Limerick city the first cases of the disease appeared towards the end of June, 1918, and were of the mild type. But by the end of October a large number of people were beginning to feel the effects of the second wave. The local authorities tried to secure more beds in the city hospitals and to recruit more doctors, many of whom themselves went down with the flu. The Corporation of that city ordered cinemas and other public entertainments to close their doors in November 1918 until the epidemic had passed –a clear sign of the fear the disease was generating. 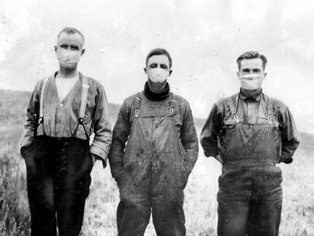 No one had ever seen a disease quite like the 1918 influenza before and many of the purported treatments were no more than exercises in wishful thinking. In Dublin in July 1918, when the authorities posted notices of ‘Spanish flu’, they recommended a dubious treatment – lozenges made from formaldehyde and lactose. Seamus Babbington in Tipperary relied on a bottle of whiskey. He had contracted the flu and then attended a Sinn Fein meeting in Carrick on Suir. He was so sick, ‘I believe I could not open my mouth’ that Dr. Murphy one of his separatist comrades, ‘ordered me out of the room and inquired if I had any close friend in a public-house who would be so kind as to give me a battle of whiskey, for due to its severe scarcity you could not obtain it in a shop then … I put the bottle to my mouth as advised and finished the whole bottle in an hour. It was the only cure then, it killed the poison … He brought another bottle next day and both bottles killed the poison before it killed me’. Kathleen Lynn a rare woman doctor and also a member of socialist republican group the Irish Citizen Army, called for returning soldiers from the Great War to be quarantined, their uniforms disinfected. She described the front in Flanders ‘a factory of fever’. She also, ‘ got from Dr. Crofton some vaccine which we had used successfully in a couple of ‘flu cases in the previous may. When the epidemic broke out, I got a supply of this vaccine from Dr. Corfton. In one night that we went to Liberty Hall, the whole of the Citizen Army there – over two hundred of them – were inoculated with this vaccine. Of this number of men, not one developed. ‘flu’. The victory parade for the Great War in Dublin in early 1919. Meetings such as this and republican rallies helped to spread the disease. The outbreak of ‘Spanish flu’ in Ireland was probably brought back to Ireland by returning soldiers but the epidemic was accentuated by the intense political activism and therefore movement of people, surrounding the General Election of 1918. In addition, being imprisoned, as several thousand republican activists were, for longer or shorter periods both in Britain and Ireland was probably the worst place to be. The republicans’ witness statements are full of mournful accounts of comrades who died of the disease in prison. Frank Drohan for example , a Tipperary man in gaol in Gloucester, recalled sadly the sudden death of one Pierce McCann; ‘McCann was amongst the five [flu patients] who were not considered so bad. His death seemed to be so unaccountable that we thought there might be an inquest or something to ascertain what exactly the cause of death was, but I learned afterwards that it was due to a chill’. ‘Another circumstance that was of enormous help to the Unionists was that the terrible and deadly post-war “black flu” was raging furiously throughout the constituency at the time, and falling with incredible partiality on the Catholic element, the Protestant element being uncannily immune. The explanation I got for that phenomenal state of affairs was that the Catholics were, as they were bound to be, far better church-goers than their religious and political antagonists, and hence the dire disease spread much more rapidly and more easily through their ranks’. Republican women in Cumann na mBan and the Citizen Army opened emergency hospitals during the epidemic. But the effects of the plague could work in all kinds of unpredictable ways. Seamus Babbington recalled that pro-British elements in Tipperary, such as servicemen and their families, ‘the ‘separation women and their children’, were especially hard hit. When the War in Europe ended in victory for Britain, they attacked republicans, ‘any pro-SF man, family or house stood danger of immediate attack perhaps serious damage’ . They were sobered though, according to Babbington, by the effects of the flu epidemic. ‘Destruction and loss of life [of republicans] would have taken place all over but for that terrible European scourge following on the heels of the end of the War; the Black ‘flu. Though millions of lives were lost in the 4 years of war … Whole families were stricken down and many lost three or four’. ‘Hushed now were the political jibes which had been flung at me as I went into houses in lanes and alley-ways seeking to bring succour to the many victims of that terrible malady which was raging throughout Europe and was leaving behind it a grim tale of many deaths. I had scarcely finished my battle against the ‘flu, when I was called again to move into another battle zone: to stand as the Sinn Féin candidate in the Parliamentary General Election in December of that year’. More constructively, some republican activists, especially the women of Cumann na mBan set up emergency hospitals to care for the victims of the epidemic. Aine Ceannt in Dublin remembered, ‘About this time also, Ireland was visited by an epidemic of flu, and Cumann na mBan members helped to nurse the sick, gratis, as nurses were impossible, to obtain’. According to another activist in Dublin Eilis Bean Ui Chonaill, ‘Cumann na mBan volunteered to nurse patients during this awful calamity. At least the members who were qualified in home-nursing were asked to help and, responded magnificently to the call. There were two depots opened, one at No. 25 Parnell Square where we met on the north side of the city and one at No. 6 Harcourt Street. There was a notice put in the press announcing and setting out the hours at which members would be available … We visited the patients at their homes in response to messages received at tie depots. Kathleen Lynn the doctor and Citizen Army member was wanted by the police but; ‘ At the ‘flu epidemic, as doctors were so very badly wanted, I just decided that I would go home, and I did. I was arrested immediately and brought to [Police Detective HQ at] Oriel House. I was told that I would be deported. Miss French Mullen, the Lord Mayor and everybody kicked up an awful “shine”. Doctors were terribly wanted at that time. I was permitted to remain in practice if I did not leave the city of Dublin’. Even the charitiable activism of the republican women did not entirely defuse the political enmities of late 1918, however. Eillis Bean Ui Chonail, ‘reported for duty at No. 6 Harcourt Street on the evening of 11th November, Armistice night, the end of the War. ‘ We suddenly realised’, she later recalled, ‘that a hostile mob were attacking the building. ‘There were many Volunteers in the building at the time including Harry Boland and Simon Donnelly who took over command. They immediately started to barricade the front a door and windows with chairs and other furniture. Soon we found ourselves hauling chairs, etc., and stacking them up against the windows and helping the Volunteers generally. Shots rang out, mingled with vile language and shouts of “God save the King!” A state of terror reigned over the whole neighbourhood until a late hour when the crowds dispersed’. As far as its political impact was concerned,the most telling intervention of the flu was the death of imprisoned republican activist Richard Coleman, from the disease, at Usk Prison in Wales on 9 December, 1918, just five days before the General Election of December 14. He was not the only prisoner to die from the flu but the timing of his death made a brief cause celebre. Sinn Féin’ alleged that he had not received the proper medical care and gave him a martyr’s funeral procession through the streets of Dublin. Frank Gallagher, assistant in Sinn Féin’s publicity department, thought that it turned the tide of public opinion by influencing undecided voters to vote Sinn Féin. The influenza epidemic in Ireland, like many of the most virulent diseases, was not, biologically speaking, the most efficient – it killed too many of its hosts too quickly for it to reproduce itself effectively. By the summer of 1919 it had burned itself out, leaving no more trace its coming than thousands of freshly filled graves. Written by: John_Dorney on 16 May, 2013.on 9 November, 2018. 24 Responses to "Ireland and the great flu epidemic of 1918"
hi my mother was born in november 1918 in ballinakill port laois and my grand mother placed her in dublin at some point and we believe she was brought up in a convent. this article is really interesting as it would appear maybe to suggest that you would hesitate to leave a new baby in dublin. i know my mother grew up so survived but as a family been trying trace her whereabouts so any help would be appreciated. maybe she was ln ballinakill till a later date, she was certainly placed somewhere with help of the catholic church. loved to hear a positive back. her name was kathleen holdsworth. Actually, John, the flu came in three waves in Ireland. In some parts of the world, for example, Sweden, there was a fourth wave. Thanks for citing my article in Pue’s Occurrences. If anyone is interested in reading more about the Irish experience of the flu see Catriona Foley’s ‘Last Irish Plague (IAP 2011), or my chapter on Irish people who remembered getting the flu as children (from my PhD on the flu) in Ann McLellan and Alice Mauger, eds, Growing Pains: Childhood Illness in Ireland 1750-1950 (IAP 2013). Also Guy Beiner, Patricia Marsh and Ida Milne, ‘Greatest Kill of the 20th century – the great flu on 1918-19 in History Ireland, March-April 2009. My great grandmother caught the Spanish flu in 1919 when she was pregnant. Luckily both she and the baby survived it but she never really physically recovered from it, dying eventually in 1925 at the age of 45 leaving 8 young children. Two uncles died together after relapse 1918 in Ballycrean Park Aughrim. Michael and Andrew aged 14 and 11. My grandmother said that they put cut onions around the windows to catch the germs from outside during this epidemic. As a result even now over 40 years after she told me that I seldom use an onion that has been part used. Again, for anyone interested in reading more about this intriguing topic, I have an article on the 1918-19 pandemic in Ireland, with a focus on Kildare, which had the highest influenza death rate per head of population in 1918, in the 2012/2013 edition of the Journal of the County Kildare Archaelogical society, just published. Believe my aunt Sara(h) Gallagher died of the epidemic in either Letterkenny,Donegal or Derry during that period aged between 22 and 25 … cannot find a trace of her funeral or death. Were there burials in unmarked graves at that time? Yes, people died so fast, and often several from the same family – Donegal was particularly badly hit. Look for her death in the death register from the General Register office, it might just be recorded. It was compulsory to certify death, but many flu deaths, from my research, were neither certified nor marked with a headstone. There are also rumours of mass graves in certain areas..
Ida, thanks for your reply. My grandfather died in Letterkenny in 1915 and Sarah was witness at his death.My cousin in Letterkenny thinks Sarah died a couple of years later from Spanish ‘Flu.Think Sarah may have moved away from Letterkenny and may have been a servant in Derry, Neither Letterkenny nor Derry Registrar have a record of her death unfortunately.There is a headstone for her mother and siblings (not father) in Conwal Graveyard in Letterkenny Maybe records at that time have been lost. Hi, my mother was one of three children in her family who had the flu in Cork in November 1918. Although she was the one expected to succumb to it , it was her two siblings who died and who were buried in St Joseph’s cemetery in Cork. She is still alive and well at 101 years of age. She also probably has some in-built flu immunity as a result of her 1918 experience! interesting snippet there about Dr Lynn. A lady who deserves more recognition. 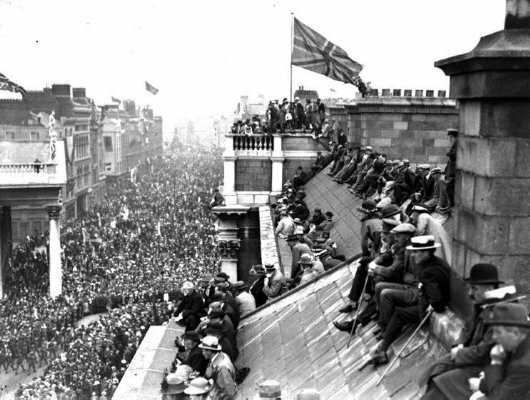 The Victory Parade photo is labelled as early 1919 but was July 1919. First time I’ve come across anything linking the flu epidemic with the parade. From the statistics, the flu had all but gone by the summer of 1919. My Grandfather died as a result of the flu but in 1921. He had heart damage from the disease which led to a fatal heart attack later. The death cert says “endocarditis of 4 years”.. Thanks Tessa, it’s amazing the amount of feedback this topic has got. The flu epidemic was clearly a very widespread trauma in Ireland in 1918 an the years afterwards. Thanks for raising the topic John! Tessa, do you have any idea when he actually caught it, as four years would indicate 1917 rather than 1918, when this flu began (first reports in early summer in Ireland) . In my PhD on the flu in Ireland, I have interviews with people who lived through the flu or whose family members died from it. Some of the interviewees spoke of their relations dying some time later as a result of damage done by the influenza, although the death certificates only permitted one – the immediate cause – of death. I looked at death rates from other conditions and there is some indication of increased rate of death from heart disease for a time after. However, as overall, health is improving and rates of death are falling, it’s very difficult if not impossible to figure out the impact the flu made on the death statistics. We suspect both of my maternal grand parents died of the Spanish flu due to records found on the online census. My grandfather who died in the 60s before I was born was listed as the head of household in the second online census. He and his brother were the only people living in the house at the time. He was only 17 and his occupation was listed as tailor. I would love to investigate this further.